If Yankee Stadium was a church June 19th would be a holy day of obligation for Yankee fans. The “Iron Horse” was Major League Baseball’s all-time greatest first baseman and perhaps the greatest athlete ever to be born in the Big Apple. In 17 years with New York he batted .340 lifetime and in seven World Series, he averaged .361. Lou had thirteen straight seasons in which he drove in and scored at least 100 runs. Along with his achievements on the ball field, his untimely illness, the grace with which he handled his misfortune, and his early death made Gehrig a true American hero. Ruth, DiMaggio, and Mantle were each truly great Yankees on the field who lived unhappy, personal lives. I always found it ironic that Gehrig, the Yankee legend with an extremely strong marriage and idyllic private life, never got the opportunity to enjoy his retirement years. Update: I originally wrote the above post in June of 2008. 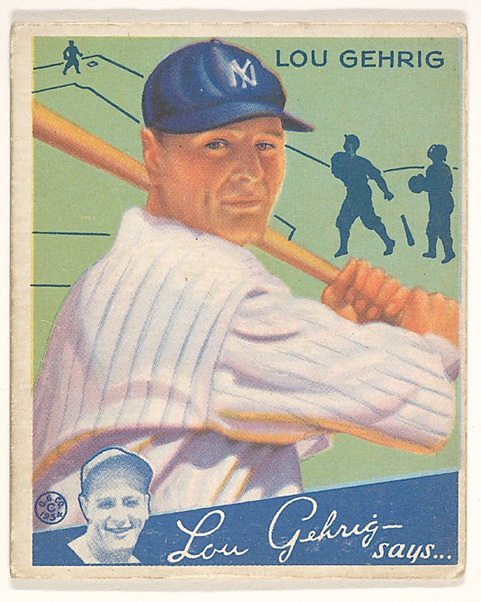 Since that time I learned something I never knew about Gehrig. I had always thought that after he was diagnosed with ALS at the Mayo Clinic, he simply returned to his home in the Bronx and waited to die. But Gehrig, who would live until June 2, 1941, over two years after his fatal diagnosis, actually accepted Mayor Fiorello LaGuardia’s appointment to the New York City Parole Commission in October of 1939. The appointment was for a ten-year-term and the position paid a salary of $5,700 per year. Besides sympathy for one of his city’s sports heroes, LaGuardia’s rationalization for selecting the Iron Horse for this job was sound. The Mayor was quoted in the New York Times after making the announcement, “I believe that he will not only be an able and intelligent commissioner but that he will be an inspiration and a hope to many of the younger boys who had gotten into trouble. Surely the misfortune of some of the young men will compare as something trivial with what Mr. Gehrig has so cheerfully and courageously faced.” LaGuardia went on to say that Gehrig had told him he wanted to dedicate his remaining days to public service and the Yankee legend meant what he said. Gehrig showed up for work regularly and did not stop doing so until just a month before he died, when he became to weak to leave his home. Gehrig shares his birthday with another former Yankee first baseman. I was pretty pumped when I learned the Yanks had signed Tony Clark in January of 2004. He had put together three consecutive outstanding offensive seasons as a Detroit Tiger first baseman earlier in his career. He was a switch-hitter and even though he was packed in a giant six foot eight inch frame, he was very agile defensively. Jason Giambi had become a disaster defensively at first for New York and he was about to experience the worst season of his career, physically in 2004. Having Clark on the roster helped the team return to postseason that fall. Though not nearly as productive offensively as a healthy Giambi was in pinstripes, this native of Newton, Kansas had his moments. He belted 16 home runs that year and at the end of May, he had a stretch where he drove in 12 runs over an 8-game period. By the end of the regular season, I thought maybe New York would bring Clark back, especially when Giambi’s physical problems persisted and rumors of his steroid use got louder and louder. Then the Yanks suffered one of the most devastating postseason defeats in the history of the franchise against Boston in that year’s ALCS during which Clark averaged just .143. He ended up signing with the Diamondbacks and having a stellar 2005 season in Arizona. Clark retired after the 2009 season with 251 big league home runs. In December of 2013, Clark replaced Michael Weiner as the Executive Director of the Major League Baseball Players Association. Clark shares his June 15th birthday with this Hall-of-Fame third baseman, one of the members of the famous Yankee core four, this former Yankee infielder and this other former Yankee first baseman. The only member of the all-time Yankee/Highlander roster to celebrate his birthday on May 8th is this right-handed first baseman who appeared in just three games during the Highlanders 1909 season. He broke into the big leagues in 1906, in Cincinnati, the city of his birth. A few other former Yankees born in Cincinnati include, Miller Huggins, Dave Justice, and Joe Torre’s former bench coach, Don Zimmer. of – Ken Griffey Sr.
One of the things that has changed most about the Major League game between the time I started following the Yankees and now is the balance of trade when it comes to Major League Baseball and baseball in Japan. Before WWII, the people of Japan had fallen in love with the game of baseball and Babe Ruth became just as popular in the Land of the Rising Sun as he was in our country. WWII of course changed the dynamic between the two countries. By the time I was Bradley’s age in the late 1950s, the bitter feelings and suspicions we Americans and the Japanese had for each other still lingered and carried over to each country’s professional baseball leagues. At the same time, however, the game of baseball was a passion shared by both peoples and it was that passion for a common game that would eventually help bring us together again. The first American to play professional baseball in Japan after the War was a Japanese American and former NFL running back named Wally Yonamine, who played there in 1951. The first Japanese player to play in America was a left handed pitcher named Masanori Murakami who played for the Giants in 1964 and 65. By the time I was a teenager, the Japanese professional leagues had become a common destination for American players who were not quite good enough to make the rosters of Major League teams. By the time my sons were born in the late seventies and early eighties, Major League veterans, who’s best playing days were behind them in the US were finding new markets for their slowing bats and fast balls on the other side of the Pacific. It took until 1995 for the pendulum to begin swinging and it was the one-time Yankee, Hideki Nomo who got it going in the other direction, when he signed to pitch with the Los Angeles Dodgers. The Yankees first ever Japanese born roster member was pitcher Hideki Irabu, who began his career in pinstripes in July of 2007. The greatest Japanese-born Yankee to date has been Hideki Matsui. The big league successes of guys like Nomo, Matsui and especially Seattle’s Ichiro Suzuki, have caused every Major League franchise to both begin and then expand their scouting operations in Japan. 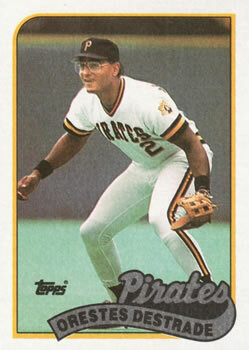 Orestes Destrade was a classic example of a young Major League prospect who struggled to make a big league roster and then traveled to Japan and became a star in that country’s version of the same sport. I can remember when he hit a bunch of homers as a minor-leaguer for the Albany-Colonie Yankees during their 1985 season. The Yankees had predicted this left-hand-hitting Cuban native would be a thirty-home-run hitter, playing in Yankee Stadium. That never happened. He failed to hit a home run during his nine-game, 1987 stint in pinstripes. He had much more success in Japan, leading the league in home runs for three straight seasons from 1990-’92. He then returned to the States and managed to hit 20 round trippers for Seattle in 1993. This one-time Yankee catcher was also born on May 8. Don Mattingly’s first game in a Yankee uniform took place in 1982, the season after the Yankees lost a World Series to the LA Dodgers. His career in pinstripes lasted until 1995. One year later the Yankees would finally make it back to the Fall Classic, with their victory over Atlanta. “Donnie Baseball” was the first person I thought about when New York third baseman Charlie Hayes squeezed the foul-popped final out of the 1996 World Series in his glove. During his first six full seasons with New York, Mattingly averaged 203 hits per year, 27 home runs, 114 RBIs and hit .327. He also made the All Star team each of those seasons, won five Gold Gloves for his outstanding play at first base and was voted AL MVP in 1985. During that period, he was the best and most popular player in baseball and he along with Dave Winfield made the Yankees perennial contenders in the very tough AL East. Even though they missed the playoffs every year, those Mattingly-Winfield-led Yankee teams played every inning of every game with a hustle and determination that made you proud to be a Yankee fan. 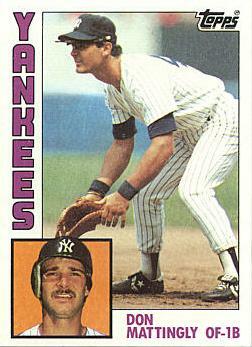 In 1990, Mattingly injured his back and it never fully healed. The impact of the injury on his swing and his power was immediate, significant and permanent. Still he persevered, playing six more seasons. I remember feeling so bad for him when a strike ended the 1994 regular season and prevented the Yankees, who were in first place at the time, from playing in Mattingly’s first-ever postseason. Fortunately, New York did get there in ’95. Those of us who followed him closely throughout his career will never forget his outstanding performance during those five October games against the Mariners. He had ten hits in that series with a homer and six RBIs and he averaged .417. Even though New York lost, Mattingly’s farewell effort to Yankee fans was one of the most poignant moments in franchise history. Donnie Baseball turns fifty-two-years-old today. I still miss watching him play the game. Mattingly shares his birthday with this long-ago New York outfielder. I believe it was my son Matthew who e-mailed me to let me know the Yankees had signed Mark Teixeira. I was both shocked and smiling when I read his message. It was early January in 2009 and New York had already snagged CC Sabathia and AJ Burnett during that free agent signing season to rejuvenate their starting rotation. The prevailing rumor was that Teixeira was going to sign with the Red Sox but at the last minute, the Yankees swooped in and made the offer that Tex was waiting for and he was on his way to the Bronx. What surprised me most as I got to watch this guy play every day was how good he really is as a defensive first baseman. I knew he was a quality hitter with good power from both sides of the plate but I had no idea that he would make such a positive impact for New York with his glove. In both 2009 and 2010, his extraordinary range and his ability to catch any ball thrown anywhere near him improved the entire Yankee infield dramatically. In fact, during the 2009 postseason Teixeira was terrible at the plate but was so good in the field I truly doubt the Yankees would have gotten to or won that World Series without him. Through 2011, his offensive numbers since arriving in the Bronx had also been pretty impressive. 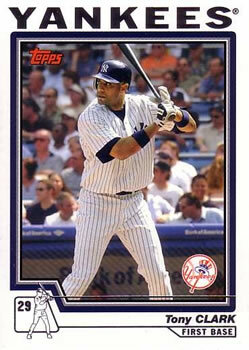 During his first three seasons in pinstripes, he averaged 34 home runs and 114 RBIs per season with 102 runs scored per year. He was on his way to similar numbers in 2012 when he suffered a calf injury in late August and missed the last month of the regular season and the playoffs. He managed to hit 24 home runs and drive in 84 runs in the 123 games he played. 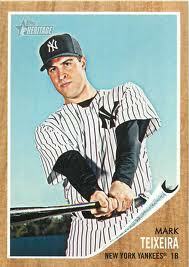 His 138 HRs as a Yankee put him in 35th place on the all-time list, two behind the late Tom Thresh. What has been dropping since he came to New York are Teixeira’s batting average, on base percentage and most unfortunately, his playing time. A torn wrist tendon pretty much wiped out his entire 2013 season and he was back on the DL just six games into the 2014 season with a groin pull. One has to start wondering if this guy has become too frail to withstand the rigors of a complete season. He has also been pretty much an offensive bust during his Yankee April’s and more problematically, his Yankee October’s. This is one of the few guys in baseball history to have hit at least 30 home runs and drive in 100 or more runs for eight straight seasons. When he’s in one of his hitting funks, it really has a negative impact on New York’s ability to score runs. I think one of the big reasons the Yanks signed Carlos Beltran was their uncertainty that Texeira could once again be the effective middle-of-the-lineup slugger they signed five seasons ago. Mark was born on April 11, 1980, in Annapolis, MD. The Yankees have him under contract through 2016. Long before the ballfields of Kalamazoo, Michigan produced Derek Jeter, the first Yankee to achieve 3,000 hits in pinstripes, they also produced Johnny Ganzel, the first starting first baseman in the history of the Yankee franchise, after it was relocated from Baltimore to New York. Known as “the first family of Michigan baseball” the Ganzel clan produced a bevy of players. There were five Ganzel brothers and every one of them played big league or minor league ball. 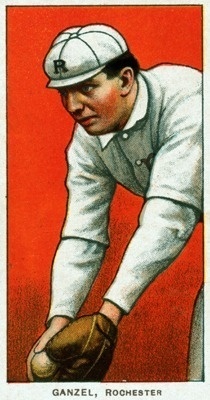 Ganzel had three prior years of experience in the National League, when he accepted Clark Griffith’s offer to play for New York’s new American League franchise in 1903. He had a strong season that year, averaging a solid .277 and finishing second on the team in RBIs with 71. He then slumped in 1904, causing Griffith to refuse the first baseman’s demand for a raise for the ’05 season. Ganzel then demanded a trade but Griffith waited until he had Hal Chase under contract before complying with his request and sending Ganzel to Detroit. Ganzel would never get to play for Detroit. Instead he became the player manager for a minor league team in Grand Rapids before taking over the same role with the NL’s Cincinnati Reds in 1908. He shares his April 7th birthday with the first manager in Yankee franchise history, this former Yankee pitcher and this one too.